The Netherlands romped to an emphatic seven-wicket win over Hong Kong in their latest tour match in Pretoria. Three wickets apiece for Roelof van der Merwe (3-19) and Shane Snater (3-29) reduced the Hong Kong innings to shreds at 92 for 7, despite the best efforts of Anshuman Rath (40). Hong Kong to their credit rallied, with Shahid Wasif’s undefeated 53 getting them up to 202 for 8, sharing stands of 62 for the 8th wicket with Tanwir Afzal (36), and an unbroken 48 for the 9th with Aizaz Khan, who made a run-a-ball 17. The modest total proved no obstacle for a rampant Dutch, whose only threat came from the heavy rain showers that stopped play on 157 for 2. Max O’Dowd made 33 in an opening stand of 70 with Wesley Barresi, who scored 63 as did Ben Cooper. The pair added 68 for the second wicket before Barresi departed. There was no respite however for the beleaguered Hong Kong attack who all suffered apart from the excellent Ehsan Khan who took 1 for 19 in ten overs. 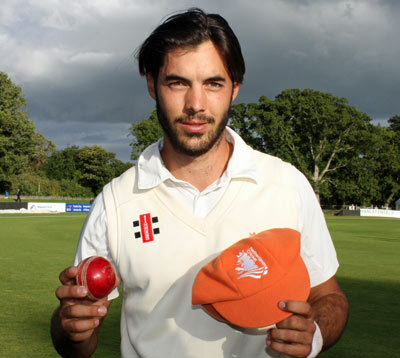 Skipper Peter Borren hit 38 in a 3rd wicket stand of 64 with Cooper before being dismissed with the scores level. The win will give the Dutch great confidence as they build towards next month’s WCQ. There was bad news however for them earlier in the day when it was confirmed that influential opener Stephan Myburgh would miss the qualifiers due to an ankle injury which requires surgery. His place was taken by teenager Bas de Leede.